Pirate Guys are seafaring types of Shy Guys that are generally depicted as wearing bandanas of a specific color. Their first appearance was in Yoshi's Story, and they only appear in Stage 5-4: Shy Guy's Ship. They have Bob-omb cannons, Bill Blasters, and other utilities for bombardment. 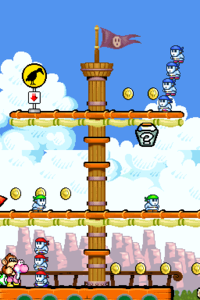 Pirate Guys reappear in Yoshi's Island DS, along with Pirate Guys who stack themselves on top of each other. They are like normal Shy Guys, except they are all white with purple shoes, wear differently colored bandanas and appear in beach-themed stages. They can be found in the level The Goonie Coast Isn't Clear!. 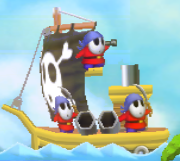 Pirate Guys return in Yoshi's Crafted World, where they stand on cardboard galleons that follow Yoshi's own ship on different planes in the background. They attend cannons that shoot projectiles at Yoshi. Yoshi can attack back by sending cannonballs to the Pirate Guys' ships, sinking them along with the Pirate Guys. In Yarrctopus Docks, they act like normal Shy Guys, just like in Yoshi's Island DS. 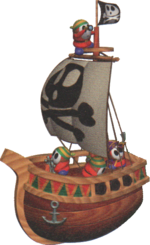 Pirate Guys also appear in Mario Kart: Super Circuit and Mario Kart Wii in the Shy Guy Beach course, where they navigate the galleon from where explosive cannonballs are sent onto the course. They also appear in Mario Party and Mario Party 8 as the flag-raiser for the mini-games Shy Guy Says and Flagging Rights, the former of which reappears in Mario Party: The Top 100. They also appeared in Mario Party 2 on the Pirate Land board where they would fire their cannons at the player sending the player flying through the air and back to start if they landed on the Happening Spaces on the bridge. Pirate Guys also appear in Mario Hoops 3-on-3 in the Koopa Beach court. ↑ Williams, Drew. Yoshi's Island DS Nintendo Player's Guide. Page 61. 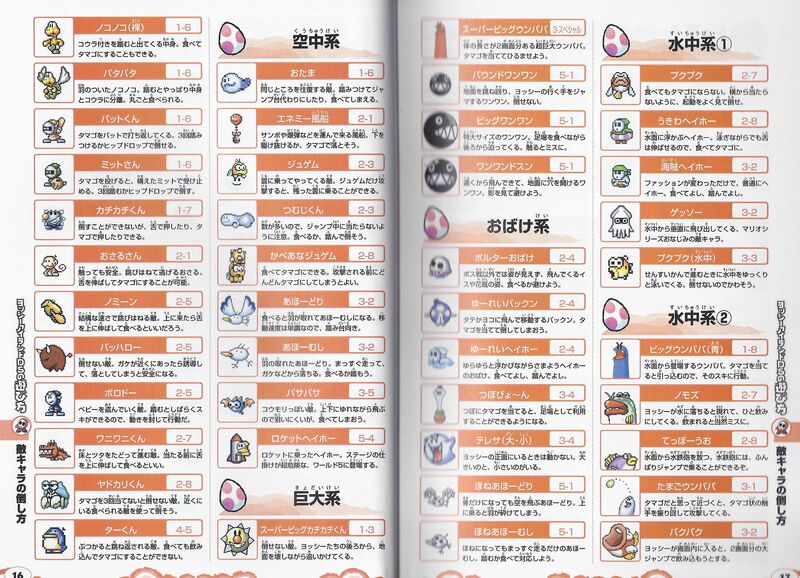 ↑ Yoshi's Island DS Prima guide, page 153. ↑ GameXplain. (September 13, 2018). Yoshi's Crafted World - Gameplay Trailer (Nintendo Direct). YouTube. Retrieved September 13, 2018. ↑ 「ヨッシーストーリー 任天堂公式ガイドブック」 (Yoshi's Story Nintendo Kōshiki Guidebook), page 100. This page was last edited on April 12, 2019, at 11:36.